On behalf of all the children of Nkumba Ministry, allow me to present this information to you. My name is Brian Nyombi Jackson Semadde. I am in Senior Six at Nkumba Christian High School. 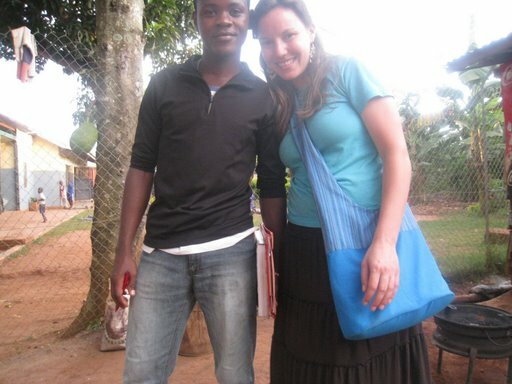 Cara Murray (who just returned from Uganda) with Brian. Cara's note on the photo: This is Brian. He is in his final year at high school and desperately wants to go to college. He has lost both of his parents and two siblings to AIDS. I pray to God and ask Him to grant you with the serenity to accept the things you can’t change, the courage to change what you can, and the wisdom to know the difference. My dearest friends did you know that morality may keep you out of jail but it takes the blood of Jesus to keep you out of hell. Jesus loves you all and he wants you to live in harmony with every one. He hates enmity and jealousy and He hates despising too as GOD has a history of using the insignificant to accomplish the impossible. Dear friends God is so miraculous that He has kept me alive amongst the family of five, as I lost both my parents at an infant age and also lost a sister plus a brother because of AIDS. But because of God’s power I’m alive, and that’s so great. Praise be to Him and I pray to Him to make me reach my goals and achieve them. I ask Him to make me a man of great influence. I pray to God to help the increasing number of orphans in the world due to AIDS, to provide them with the basic necessities and give them hope, that with you dear Lord Father they will continue to live despite what they are going through.